What to know: Beautifully animated short about the loss of the seasons and how a young Native boy goes in search of the Bear that controls the seasons. Beautiful. This is exactly the type of programming that resonates with us for inclusion in the KIDS FIRST! Film Festivals. Beautifully animated and wonderfully inspiring storyline. The story revolves around the loss of the seasons and a young Native boy who goes out to find the Bear that controls the seasons. His journey is difficult but he perseveres, finding assistance from many along the way. He eventually has to wander into the dream world to find the Bear. This is one episodes from a longer series and I would love to see more from this series. The animation is lovely - bright, simple and mindful of portraying the culture accurately. The background music adds much to the story, without being obtrusive. The storyline is classic Native storytelling and one worth passing down to generations. I highly recommend it, giving it 5 out of 5 stars and recommend it for ages 5 to 12, as well as adults. Reviewed by Julie S., KIDS FIRST! Adult Juror. This is a collection of beautiful tales - both forgotten wonders and original stories. The series has been designed to pass on these narratives and to open children's minds to other cultures. Set to beautiful music, each episode takes us on a new journey. With the magic words "Once upon a time..." the wonderment begins and the mischievous storyteller brings to life a cast of extraordinary characters from around the world. 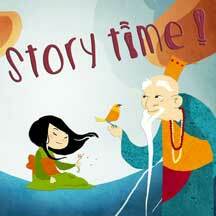 This endearing and amusing series is suitable for preschoolers and the whole family. From France.